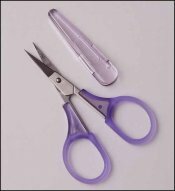 Lavender (Violet) Cotton Candy 3¼ Embroidery Scissors  - $8.50 : Yarn Tree, Your wholesale source for cross stitch supplies. ***Temporarily Out of Stock*** Item 4527. Lavender or Violet Cotton Candy Embroidery Scissors. Just the cutest little scissors dressed in colorful Lavender soft handles. Very sharp points for detail embroidery. Perfect for any type of needlework. Compact size is ideal for classes and your tote. Comes with a matching color sheath. Also referred to as Rainbow Thread Cutters ES-1091-SL.